Do any of the older people in websites, brochures and advertisements look like or act like any older person you know? Why is everyone so white? Why does everyone have such perfect teeth? Why do they all look so…dopey? Ask the stock photography houses, those libraries of images used by advertisers and publishers (including Senior Planet). The photographers who supply these photos work with senior models and create the types of images they think represent “older.” It makes for a funny but cringe inducing collection. Take that popular category “Active Senior.” It’s nice that they realize most of us can get around without walkers, but their choices of activities and situations range from “overly cute” to ‘deranged.” Here’s a cross section of images from the stock library Thinkstock. If you’re an active senior, or if you want to be, take a look and see how closely your experience matches the assumptions about active older people. 1. 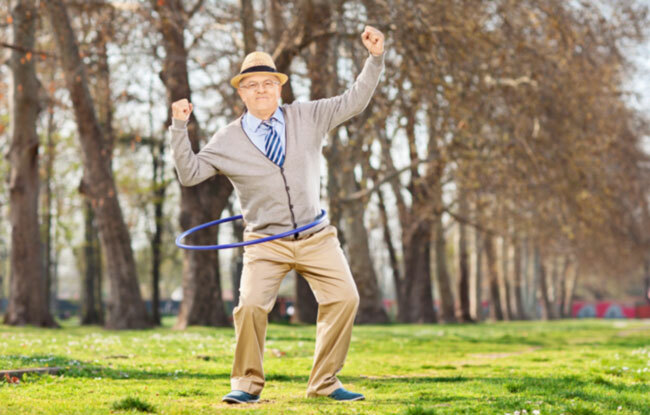 Active seniors love hula hoops and will take any occasion to use one, even to shimmy — almost —across a stage. And fail at it. 3. There’s nothing like a hula on the beach. 4. Active senior couples love to crack jokes during a spirited game of hoops. 5. Active senior couples enjoy synchronized exercise and wardrobes; they wear grey to match their hair! 6. Senior couples – even active ones – enjoy outdated gender roles. Wheelbarrows are a must. 7. An active senior couple out for a walk is so seldom seen ‘in the wild” that they should carry a wooden photo frame in case a photographer is strolling by. Snap snap! Question: Which stock photo do you find the funniest – or the most insulting! What Would Your Name Be If You Were Born Today? If the writer laments the fact that these photos show only white people, then the writer should (a) choose different photos or (b) take photos of non-white seniors. Create the reality you want instead of complaining about the work other people have done. This is the Land of Opportunity ( to create what you DO want), not the land of Sit-back-point-the-finger-and complain about what you DON’T want. Funny and apt…but as a Senior, I can tell you that we like idealized photos a lot better than sad, sick or intentionally degrading, catching people at their worst. And while my lifelong friendships include those of other ethnicities and genders, I’m also tired of advertising that depicts them as enjoying a lifestyle that represents the values of the American middle class which is more often not their own backgrounds. Not keen on the Pop culture purple hair with body piercing either. People and their backgrounds are what they are and that should be acceptable, even celebrated. Those who want to change their locations, lifestyles, educations, careers or appearances should be free to make those changes and live accordingly. But, the plethora of photos projecting everyone to the middle class American ideal is insulting to them and to those whose backgrounds are American middle class. Why is everyone so white? What is it that is truly being said with such a comment? That being white is a problem, an unacceptable problem? Why the need to point out a race or ethnicity. The concept that “nobody looks like me” is faulty. I enjoyed the spirit of your post. So white, and such perfect teeth! And how the heck is she going to get out of that barrow? I would prefer soft focus romantic dinner shots. At least that would be more realistic. This is an interesting article because I’ve been an “older model” since my 40’s when my hair turned white. What could be more fun than riding in a hot air balloon being filmed by photographers in a helicopter? Today, at 84 yrs, I’ve come down to earth and now sing Rock and Roll with The Young@Heart Chorus. LIFE IS GREAT! WHAT’S NEXT? Funniest is man in a hat and tie hula hooping. Most backward: man pushing his wife in a wheelbarrow as if he wants to take her to the dump or compost heap and get on with his life! At 40 years old – I’ve been a fan of your page for a couple years now and I love it. Your content is always ON!